If you made our Christmas cake recipe, or would like to decorate a shop-bought fruitcake, here is a beautifully simple idea to follow. Optional: ribbons to tie around cake. Note: Glycerine is available from most chemists. If you don't have any Christmas tree cutters, make two templates, one 6cm (2½") in height and the other 3cm (1½") in height. Turn the cake upside down onto the cake board. Brush the cake with half the jam. Take 675g (1½lb) marzipan and, on a surface dusted with icing sugar, roll out into a circle about 8mm thick and large enough to cover the top and sides of the cake. 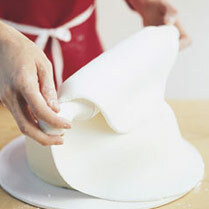 Gently smooth the marzipan over the cake, working from the top, then down the sides to the board. Trim off any excess at the base with a small knife. Leave to stand for 24 hours. Brush the marzipan with the remaining jam. On a surface dusted with icing sugar, roll out 675g (1½lb) regalice to about 5mm thick and large enough to cover the top and sides of the cake. Cover the cake then leave for 24 hours. Use any leftover marzipan to make petits fours or let the children use it to decorate biscuits. To make the Christmas trees, roll out the remaining Regalice to 2-3mm thick. Cut out 5 large and 5 small trees using cutters. Place on a board dusted with icing sugar and leave to harden for 24 hours. To make the snow icing, beat all the ingredients together until the mixture forms stiff peaks. Using a palette knife, generously spread the icing on the board around the cake, peaking it into spikes. Arrange 4 small trees around the board in the snow icing. Spread a generous amount of icing on top of the cake, peaking it into spikes, and arrange the remaining trees in the icing.